Even before the doors opened, brides eagerly waited to step foot into an exhibit hall adorned with sophisticated, eye-catching mandaps and scattered with vendors artfully displaying the latest jewelry and clothing designs. 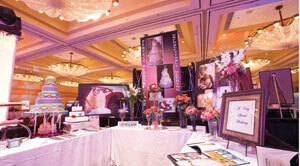 The MyShadi Bridal Expo held on April 17 at the Crowne Plaza Ravinia in Atlanta, Georgia, kicked off to a great start as a varied group of attendees shared their engagement stories and vendors promoted their services. Future brides, grooms, and their families perused over 50 vendor booths during the Expo looking for decorating ideas, finalizing wedding plans, and tasting food samples. After four successful MyShadi Bridal Expos in Florida, show sponsors Desh-Videsh Media Group launched their first expo in Atlanta, giving brides in the local area a chance to experience the unique event. For South Asian brides planning a traditional wedding in the United States, the Bridal Expo offered them the opportunity to visualize ways to incorporate classic elements into a contemporary wedding theme. 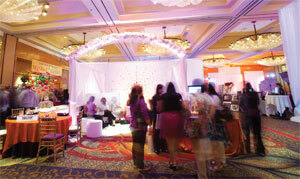 e Bridal Expo] was amazing … I really enjoyed it, and best of all, my fiancée enjoyed it too! There were so many vendors it gave me a clearer idea of what I want to choose to be a part of our wedding,” said Anita Rao. For future brides, grooms, and their respective families, the Bridal Expo was a one-stop shop to peruse anything and everything one would need for a dream wedding, be it South Asian or American. From banquet halls, event planners, and decorators, to DJs, photographer/videographers, and wedding performers. There were also estheticians, jewelers, clothing boutiques, and even a limousine vendor. Caterers offered mouth-watering paneer wraps and delicious cupcake samples to give Expo attendees a flavor of possible wedding fare. An energetic dance performance by the Georgia State University Bhangra team, Aasmaan, got the crowd moving mid-afternoon. Another highlight of the afternoon were the two fashion shows that highlighted the latest trends in bridal and formal wear. Queenie Indian Couture showcased bridal saris and lengha choli suits in the first fashion show, and Mehr ‘n Nisa showcased formal wear for men and women using pure, non-synthetic fabrics during the second fashion show. During the entertainment segment, attendees lined up for their chance to win one of several door prizes generously donated by several vendors. The grand prize drawing, announced after the final fashion show, was a free trip to India for one lucky couple. Jennifer Gionfriddo and Arun Lall, to be wed in the spring of 2012, were the ecstatic winners of the free honeymoon trip to India provided by Qatar Airways. Desh-Videsh wishes them and all other future married couples all the best in their new lives together. Desh-Videsh Media Group also thanks Platinum Sponsors Occasions by Shangri-la, TV Asia, Qatar Airways, Trip Explorer, and Crowne Plaza at Ravinia for their support in making this Bridal Expo a tremendous success.